Since his childhood in New Haven, Connecticut, Kevin Derken has been associated with the nickname “Klav”, one that his family still uses for him to this day. Of course, back in his youth, Derken had no notion of what Maschinen Krieger was or how it would one day shape the direction of his artistry under the Klav alias. During his time at Hartford Art School, where he earned a BFA in sculpture, Derken remembers focusing mainly “on large formal works influenced by Donald Judd and Mark Rothko“, though he “literally struggled to make work that was successful”. Working on the Xbox 360 video game Chronoblast (2013) from Nortygames resulted in a low point in Derken’s personal artistic output, but “when I pretty much gave up,” Derken recalls, “everything came together”. Maschinen Krieger is, according to Derken, “the biggest Japanese mecha franchise you’ve never heard of”, one that has “no movie or manga, just some loosely pieced together narrative from a bunch of magazine articles.” Initially serialized under the title SF3D in Hobby Japan from 1982 to 1985, these photo-illustrated articles by Kow Yokoyama, Hiroshi Ichimura, and Kunitaka Imai detail the various battlesuits and war machines used in futuristic conflicts between a fascist government and rebellious colonists. With the designs being released regularly as model kits by Nitto until 1986, a legal dispute would prevent the line from having further productions until Kow Yokoyama began them anew under the name Ma.K. ZbV3000 Maschinen Krieger, or simply Maschinen Krieger, in 1999. And this “slew of newly manufactured model kits”, Derken explains, allowed him to acquire twelve kits early in 2012. By November of the following year, Derken had become so proficient that one of his pieces — a hand-painted, 1:20 scale Königs Kröte (Winter Version) resin garage kit — would be selected by Kow Yokoyama personally as “Best in Show” at the Maschinen Krieger Modelers Showcase, Vol. 9 in Tokyo. 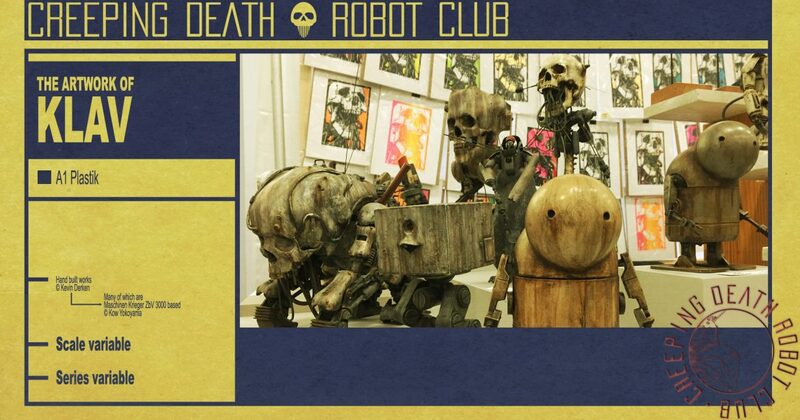 In that same 2013 exhibition, Derken displayed his Maschinen Krieger S.A.F.S Munny, which he feels was “over shadowed” by his award winning piece. Having acquired the Kidrobot produced vinyl form from Carlos East of The Beast Brothers “about a week before he moved to Los Angeles from New Haven”, Derken’s “wanted to bring my painting style to the Munny“. But more than simply painting the piece, the artist reconstructed it into the likeness of a Ma.K Super Armored Fighting Suit. “The fabrication took a few days, if I remember”, Derken’s admits. “I sliced the head open and lopped off one of the arms”, using epoxy sculpt to add the Maschinen Krieger reminiscent elements, including the entire head with the interior cockpit. And this successful venture into heavy modification would lead the artist to push himself further. “One night, after a few hours of inhaling lacquer thinner mixed with a few glasses of red wine”, Derken remembers, “I posted a photo of 3D printed skull on a Krote body on a Ma.K Facebook group. The next morning, I woke to a message from Yokoyama-san, saying that I had to finish this build.” The resulting work, his Death Head Krote (2014), would be his first modified Maschinen Krieger piece. In what he likens to “Yokoyama-san’s original scratch building techniques” from the Hobby Japan article days, Derken “started to view the hundreds of Ma.K kits” he owned “as a library of spare parts to build with”, but he didn’t restrict himself to solely Maschinen Krieger pieces. The skull, which has become a signature component of Klav constructions, adorned the Death Gorem (2017), whose body was solely composed of vintage Zoids parts. And while Derken feels that his “original creations belong in their own universe”, he admits that he’s “not really sure where that is”. In 2016 came an opportunity to further explore his original works as Derken was invited to create models to be used in the film Violent Starr (2018). While still inspired by Maschinen Krieger, especially noticeable in the robotic Deathspotter and its likeness to the Ma.K Neuspotter, these pieces built from scratch afforded some freedom in their forms’ creation. Contrasting his former color choices with pops of bright color on the Death Wing spacecraft, this expanded palette would begin seeping into his future pieces. And this is certainly apparent with his Birdbrain (2017) work, the colorfully decorated Spotted Woodpecker model kit head seamlessly flowing into Derken’s more historically standard S.A.F.S Fireball body. Furthering his “interplay of machines and organic matter”, the artist refers to pieces like this as “fantastical-mutation characters” that juxtapose and offset his “devastatingly evil looking” skull works. But these all remain focused on the Maschinen Krieger appearance, emphasized by the artist’s proclamation that “I love the Ma.K. universe”. And, while “Yokoyama-san has been such a great mentor to me”, Derken notes that “I need to move on”. “I’ve always viewed my pieces as individual works, to be viewed as a singular form”, Derken admits. “However, I am planning on an installation-type piece of multiple Ma.K./ SF3D kits in a wall display.” And, following this exhibit, he is “hoping to sever my ties to Maschinen Krieger and the modeling world”, save for “a few Star Wars things thrown in”. While Derken has previously created works derived from Star Wars parts, like the Death AT-ST (2016), they still maintained a rather strong Maschinen Krieger derived appearance. For this next stage in his artistic journey, Derken will be “trying to focus mostly on my own Klav-iverse builds”. Announcing himself to be “seriously ready to push my work as far as I can”, the first examples of this direction took form of Skunny D and Skunny M (both 2017), whose titles are derived from the “s” in skull added to the latter part of the Dunny and Munny names. Being the first instances of Derken modifying Kidrobot produced pieces since 2013, these are reminiscent of his Death Head Krote concept without the Maschinen Krieger aspects. Having heavily altered the forms by excising elements and adding epoxy putty builds within, the drooling array of springs stream down from mechanically modified skull-like heads.